Ipsy February 2019 Spoilers Round #2! What do you think of the glam bag design and spoilers? Click here to sign up and make sure you get this bag! I’d like the Belle En Argent lippie, but so far none of the spoilers thrill me. Hmm, looks like not the best month maybe I’ll pause for this month. I hate that they don’t allow you buy anything else on the website when you do that though. That should technically hurt their business too. I resigned up for Ipsy wanting the Ipsy + but it has me with the regular subscription. How do you change it? I waited for over 5 months and still no Glam Bag Plus. I cancelled Ipsy last month and I’m glad I did. I’m thinking about switching to Sephora Play but haven’t made up my mind yet. I did not like Sephora Play. Their samples are super small and your basically getting what you can get free by asking for samples in the store. That glamglow, bell en argent, and the hair mask look nice. Is this spoilers for the regular bag or Glam bag plus? The Ipsy GLAM bag is what they’ve always called their regular subscription, as far as I know. It’s been called a “glam bag” for the 2 years I’ve been subscribed, with no other options except for the “glam bag plus” for the bigger one. I do agree that the products have been more geared towards younger people. I also wish “glitter free” was an option on these beauty subscriptions lol. I always end up giving the more ridiculous stuff to my young daughters to play with and anymore that’s been 3 out of 5 products in my bags lately. I’m 36 and wear crazy colors all the time (including super metallic, odd colored shadows & lipstick) but all that glittery crap (and hot pink, etc) goes right to my 12 and 4 year olds and it’s kind of a waste. I used to like getting lots of skincare in my bags and lately I’ve just been getting masks, glittery gloss, brushes and usually a blush & eyeliner. I’d rather have highlighter & mascara & literally have that in my preferences and every review but its stayed the same. I’m on the verge of just keeping my 12 year old’s but cancelling mine. I’m not sure I know what “blackish” blush you received. Was it perhaps the Ella Eden eyeshadow in Willow. That’s a fairly dark color. ‘Goth Grammy’ – if you don’t want that tag, can I borrow it? If I get another brush from Ipsy after telling them twice to stop sending me brushes, I’m canceling my subscription. Looks like a great month ☺ i would be happy with all but the bright pink gloss. I think the bag is adorable! I got both the GlamGlow and Prickly Pear gloss in my January bag and I love both. I love Ipsy. Have been subscribed for 3 years and have never received a repeat item yet. The prickly pear gloss looks super fun and really pretty. It would be really nice for summer with a tan. The spoilers are looking good so far! I want both lippies! Maybe the brush and glamglow too. Looks so much better than this month’s. I’m excited. One time when I thought that about a tube, it turned out to be a mascara, and I was so disappointed because OMG I’m sure we’ve all been sent plenty of mascara (and black eyeliner)! Ipsy has been pretty good but I don’t like Feb bag, so I think I will skip. I changed my frequency to every other month and I’m still considering letting this one go. It just doesn’t compare with my other subscriptions anymore. 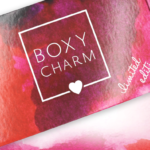 I feel like I get a diamond in the rough every couple months but the rest just gets donated… I just feel I’ve outgrown this one and since GBP isn’t available in Canada it just can’t hold a candle to my boxycharm, boxy lux, and fabfitfun. Even though its not as expensive, its still a waste if I’m not enjoying anything I get. Rachel, I echo your sentiments. I live in the US and the GBP is still not an option for me yet. In light of my other subs to Boxycharm, Boxyluxe and FFF, I cancelled my Ipsy on yesterday. I’m glad I have another shot at getting the LAQA and Co prickly pear gloss! I’m jealous of those who got it this month! Ipsy’s been feeling lackluster lately (and not just because of delivery issues). I’ve basically been waiting to redeem my points on good rewards (which are also lacking) then I’ll probably cancel for a bit. I hope I get Elemis, I have used that cleanser and love it! I also hope I get Huda beauty, I’m dying to try that brand.